A three bedroomed semi-detached house situated in a non-estate position within the pleasant village of Timberland. The property enjoys gardens to the front and rear, as well as a driveway and Single Garage. Internally the property offers living accommodation to briefly comprise of Entrance Hallway, Cloakroom, Lounge, Kitchen Diner and First Floor Landing leading to three Bedrooms and Bathroom. The property further benefits from uPVC double glazing, oil fired central heating and is being sold with No Onward Chain. Viewing of the property is recommended. LOCATION Timberland is within easy access to Metheringham which offers a range of local shops and amenities, as well as a train service into Lincoln City Centre and Sleaford. The popular village of Woodhall Spa is also easily accessible. SERVICES Mains electricity, water and drainage. Oil fired central heating. ENTRANCE HALLWAY With uPVC external door to front elevation, stairs to the First Floor Landing and doors to the Cloakroom and Lounge. CLOAKROOM With uPVC double glazed window to front elevation, low level WC, wash hand basin and radiator. LOUNGE 14′ 9" x 11′ 7" (4.5m x 3.53m) With uPVC double glazed window to front elevation, radiator, coving to ceiling and double doors leading to the Kitchen Diner. KITCHEN DINER 15′ 1" x 11′ 0" (4.6m x 3.35m) With uPVC double glazed door to side elevation, uPVC double glazed window and double doors to the rear elevation, fitted with a range of wall, base units and drawers with work surfaces over and tiled splash-backs, stainless steel sink unit and drainer, integral oven and four ring ceramic hob with extractor fan over, plumbing and space for a washing machine, radiator and under stairs storage cupboard. FIRST FLOOR LANDING With uPVC double glazed window to side elevation, bannister rail, access to roof void, radiator and doors leading to three Bedrooms, Bathroom and airing cupboard housing the hot water cylinder. BEDROOM 1 11′ 8" x 9′ 1" (3.56m x 2.77m) With uPVC double glazed window to front elevation, built-in wardrobe, over stairs storage cupboard and radiator. 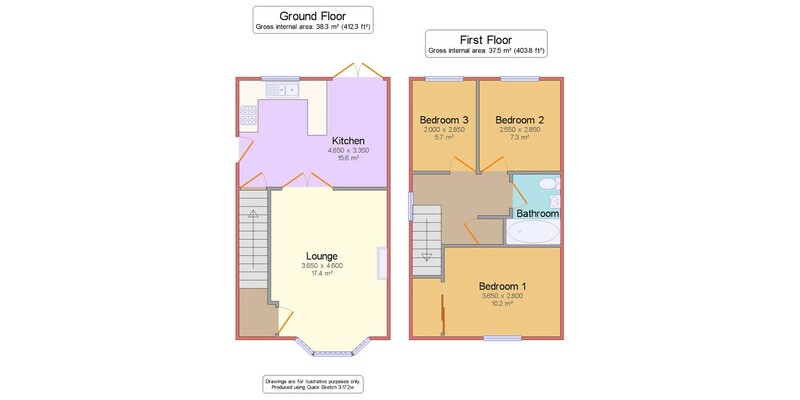 BEDROOM 2 9′ 4" x 8′ 2" (2.84m x 2.49m) With uPVC double glazed window to rear elevation and radiator. BEDROOM 3 9′ 3" x 6′ 5" (2.82m x 1.96m) With uPVC double glazed window to rear elevation and radiator. BATHROOM With suite to comprise of low level WC, wash hand basin and bath with mains shower over, partly tiled walls, tiled floor, radiator and extractor fan. OUTSIDE To the front of the property there is a driveway providing off road parking and giving access to a Single Garage. There are lawned gardens to the front with a range of plants, shrubs and trees and there is side access to the rear garden which is principally laid to lawn with a patio seating area.